There are two main needs that need to be met: firewood and shelter. 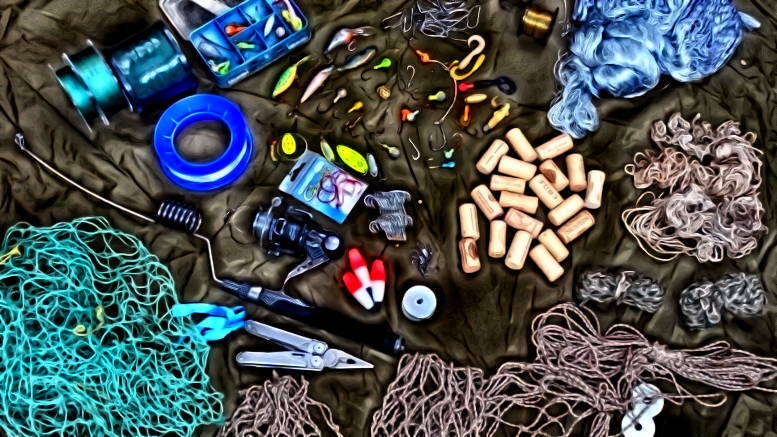 Efficiency, versatility, safety, portability, weight, and durability are important for a long term wilderness survival scenario. Efficiency is key; you must use only what you need. There should be no resources or energy wasted. Good technique for using an axe involves the entire body, and uses your core, back, and arm muscles. Momentum and gravity help propel the axe. An axe would be more efficient to cut small firewood; on the other hand a saw would cut through large diameter logs using less energy. Think outside the box to reduce the energy and time spent: use your fire to do the work for you by burning the ends or middle of your logs. If you have a fire inside your shelter you should have space to bring in large logs through the entryway and burn them without having to cut them. What type of long term shelter would you build? Consider using small diameter trees to make it more manageable. If you will build a notched log cabin consider bringing both: cutting dovetail notches would be easier with a saw and cutting the trees might be faster with the axe. If you are building a shelter based on traditional indigenous shelters then you might build them with just an axe. There is no contest here. The axe is the most versatile. It can be used additionally as a hammer, knife, and even a weapon; the saw doesn’t have those uses. Where the saw excels is in making straight cuts and sawing through hard materials, like antlers. Axes are very dangerous in inexperienced hands. A saw could chop a finger at worst, but an axe could cut your foot off and cause deadly bleeding. The longer the axe the safer it is to handle. If you are cutting a branch off a tree, the higher your cuts are the more dangerous they are. In season 4 of Alone one of the participants was evacuated due to an accident involving his axe; he was walking with it without its sheath on. Safe handling an axe is not optional. When I was in the forest for 6 months I would have to remind myself and be disciplined to use only safe techniques with an axe. Having an axe mishap was probably the greatest risk out there. I had to be very focused on what I was doing and not be arrogant with my skills. I would recommend reading the excellent book Northern Bushcraft by Mors Kochanski to learn the proper axe techniques. A saw is more portable than an axe. For example a 7.5 inch folding saw weights 14 oz while an 11 inch full tang hatchet weighs 22 oz. Another good option specially for packing a wilderness bug out bag or INCH bag is to carry only a saw blade or an axe head. You could craft a buck saw in the field using natural materials and just two bolts, a cord, and a saw blade. Or you could carve an axe handle in the field. Although you might need a small hatchet to split a log for the handle (using wooden wedges). An axe is more reliable and durable. If it has a wooden handle then you could replace it in the field if is breaks. It is easy to nick the edge of an axe if you accidentally drive into the ground though, so use it properly if you don’t want to spend hours resharpening the edge. A saw blade would brake much more easily than an axe head. Saws generally have more weak points due to their construction, like the folding mechanism. An important aspect is sharpening. 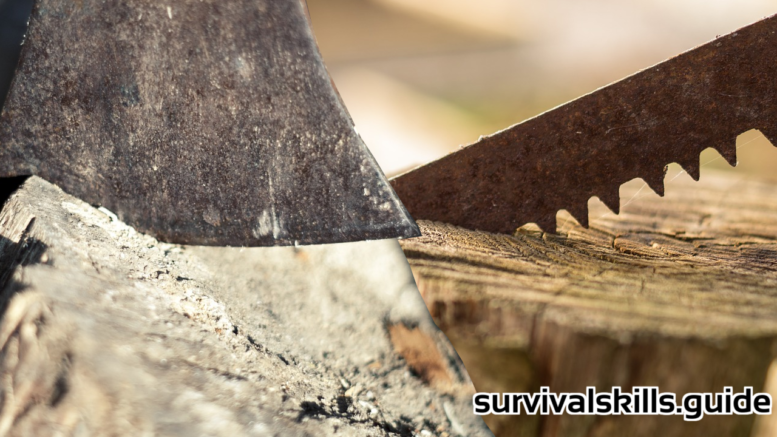 Have you wondered how to sharpen your serrated survival knife? You probably didn’t think about that if you bought one. Would you pack a knife for long term survival if you couldn’t resharpen it? It is complicated and time consuming to sharpen a saw with a small file. So you might as well forget about it and assume that the edge of the saw won’t last a lot of heavy duty use. On the contrary, any axe could be sharpened using rocks or a knife sharpener. It definitely depends on your skill level, kind of shelter you would build, and size of trees in your area. If in doubt go with an axe. Axes have been used for thousands of years. They just work. Keep it Simple. In my opinion an axe is more important to have in a long term situation than a saw; I think there is no debate. The question should be: is an axe enough or should I bring a saw too? Depends how much weight you want to carry. Life is about compromises. If you want to have it all a good compromise would be to pack a medium length axe and a saw blade. That way you could make a buck saw in the field. 4 Comments on "Axe or Saw for Long Term Wilderness Survival?" Because I want to have feedback from the readers, and learn from their perspectives. I personally would go with an axe over a saw. I’d also go with an axe over a knife if I could only choose one bladed instrument. The axe really only does one thing well and that’s chop, but it can do pretty much anything you may need it to. That’s something a knife or saw can’t say. The saw is much more quiet if stealth camping is being practiced. BUT saws break – axes don’t. Well, their handle does, but that is where a tomahawk with round eye comes in. In fact, a light – mid sized tomahawk head kept in ruck sack may be worth the extra weight, just as a back up. For situations where two persons working is better than just the one. If the wood to be cut is small, pushing the branch / limb into a trunk or rock cavity and pulling / pushing to break apart is how we do it. But if tinder is needed, the axe / hatchet has a big advantage in gaining it with speed. To me – they are both a toss up. I carry both of these in my go bag. Les Stroud bushman axe and the Sven 21 saw, each has it purpose.